Delicious and unique Fresh Apple Crumble Cake, with layers of apple, encased in a lovely crust and with a wonderful crumble topping. I love to read Italian baking forums. Italians are, among other things, great bakers. The only small issue … they’re written in Italian and I’m always totally at the mercy of google translate. Sometimes, the words just don’t translate into things that actually make sense. This is particularly troublesome when dealing with baking recipes, where precision and clarity kind of help. If I’m intrigued enough by a recipe though, I’ll often just take the part that I can figure out and wing the rest. Let’s just say I did a lot of “winging” with this one. Combine the translation issues with rampant, last-minute ingredient substitutions and a scale that decided to go on the fritz half way through and I have, quite possibly, turned it in to a completely different recipe. No matter, this cake was one of the best things I’ve eaten in some time, and given how much I bake, that’s saying something! This cake has such a unique preparation. I don’t think I’ve made anything quite like it. I was expecting the base to be somewhat like a pie pastry, but it actually comes out like sand. I was sure I’d already messed up the recipe when I scattered it into the pan. I just went with it though. After 20 minutes in the oven, the crumbs had set and encased the apples. Then when you pour the egg mixture over top, you’ll be sure that it will never come together as anything that will eventually be sliceable, but it does. It’s awesome! Those sandy crumbs bake up into a crust that my daughter thought tasted like shortbread. Inside are tender apples, surrounded by a creamy thick sauce. The crumble topping provides lovely sweetness and crunch (and look awfully pretty, too). It’s perfection. As you can see from the photos, the sides of my cake got a bit more browned than they should have. It wasn’t obvious until I removed the ring from the springform pan. I had started to doubt the oven temperature I should be using and had bumped it up a bit during the last stage of cooking. Then, when I checked it in the oven at the 60 minute mark (total cooking time), it was sunken in the centre. Convinced that it wasn’t cooked yet in the middle, I gave it another 5 minutes. I probably shouldn’t have done either of those things. That’s clearly just the way this cake bakes. As long as the cake is not “jiggly”, somewhere around 60-65 minutes total is just fine, even if the centre is sunk down. My cake was made with half and half cream (10%) and full fat sour cream. I used Empire apples. It is best on the day it’s baked, but still good next day. A delicious apple dessert that has a unique "crust", a moist apple filling and a crisp, crumbled topping. The original recipe was in grams, so if you have a scale, use those measurements. Make the cake: In a food processor, add the flour, sugar and baking powder. Pulse a couple of times to combine. Add the cold butter and pulse until the butter is combined with the flour. You'll end up with a very dry mixture, like sand almost. Sprinkle about 3/4 of this mixture over the bottom of the prepared springform pan. Don't press it down at all, but move it around a bit so it goes up the sides just a bit. Scatter the prepared apple slices over the crumbs (avoiding the sides), then sprinkle the remaining crumb mixture evenly over the top. Again, do not press down. Leave it as is. Bake in the preheated oven for 20 minutes. When the cake has baked for 20 minutes, remove from oven. (The egg mixture should have set somewhat so that the crumbs won't sink into the cake. If it is too liquidy still, return to the oven for a few more minutes.) Evenly sprinkle the crumb mixture over the top. Return to the oven and bake a further 20 - 25 minutes or until the edges are starting to become golden and pull away from the edge and the center is set. As long as it's not too jiggly and a tester inserted in the centre comes out with just crumbs (not liquid), it's ready to take out of the oven. It should have bake about 60-65 total, including all 3 steps. It just came out if the oven! My house smells A-mazing! My 3yr old helped me make it and is also excited to taste it :) thanks for sharing! Super easy to make too. Hi I was hoping to bring this to an Easter brunch, it looks amazing! Do you serve it hot out of the oven, room temp, out of the fridge? My girlfriend and I will be trying this out tonight! I’m a BIG fan of apple pie so I’m stoked to try this unique twist :) Just a quick question about the apples used…I don’t think I can get Empire, do you have any recommendations for other apples? Are crisp, sweet apples best, or would a tart apple like Granny Smith work? Hi Claudia, I wish I could! All I remember is that it was a baking forum (in Italian). I copied down the ingredients/instructions after I translated it in Google translate. When I went back to try and figure out where I got it from, I was not able to find it again. Portanto, fico feliz que tenham gostado, Marlene! Muchas gracias, Marlene. Estoy tan contenta de que te haya gustado! Delicious, gooey, amazing cake but – speaking as a European reader – may I just point out that an 8″ springform pan is 20cm not 24cm. 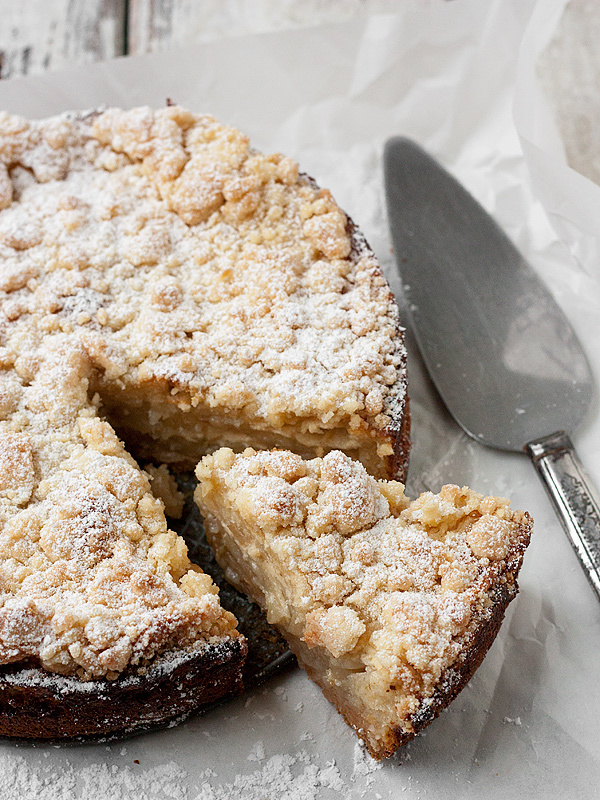 This apple crumble cake looks amazing! 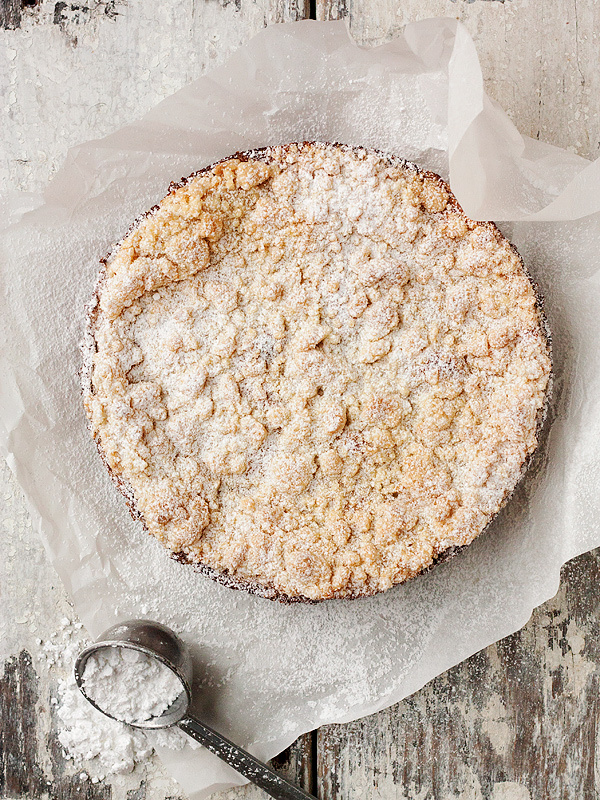 Crumble cakes are one of my favourites this time of year! Love light dusting of icing sugar, so pretty on this delicious cake! Oh man, I just stumbled upon your blog and I am so happy I did! This looks incredible – browned sides and all! I completely agree with you, Italians are some of the best bakers – I swear every Italian I’ve ever met was a genius in the kitchen. I am definitely trying this recipe. Thanks Amanda! I love everything Italians cook :) Enjoy! 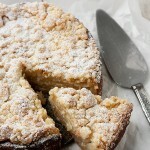 Hi Jennifer, this cake is the whole package, love the crumb topping! Wow this is most stunning apple crumble I have ever seen! I am making this this weekend, no doubt! 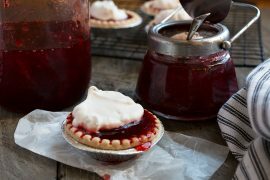 You have the most beautiful blog, the images and recipes are lovely and delicious looking. 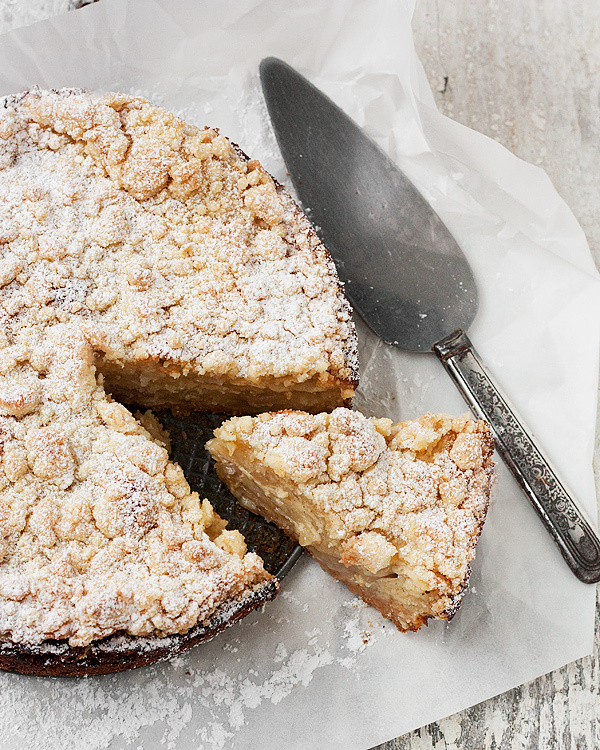 Who wouldn’t want to make this gorgeous apple crumble cake? Thanks so much, Christina. I’ve made this cake several times since posting it. It’s delicious and easy! This apple crumble cake looks amazing Jennifer – I am in full apple mode right now! Gotta love Fall! Me too! This cake is delicious. I’ve made it many times since I first posted. Great Fall dessert. Beautiful looking cake! Just love that gorgeous crumb! Thanks Jessica. The crumb was delicious! Hi, just stumbled across this today via Pinterest. 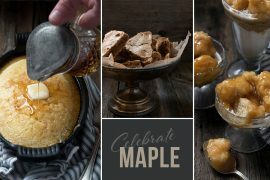 Love the photography and want to try the recipe. Do you happen to remember the original source of the recipe (the italian recipe)? Thanks! Hi Elizabeth, Sorry, I don’t off-hand. I recall it was a baking forum (as opposed to a site), where home cooks share their recipes, but that’s about it. Hey Jennifer! You have such a lovely blog. I just made this recipe last week using alternative flours and it was really delicious! A really interesting way to bake a cake – everyone loved it! Thanks for the inspiration! Thanks so much, Elly and you have a lovely blog yourself :) So glad you enjoyed the cake. Your version looks delicious! I LOVE this cake! This will be the 7th one I have made over the past 2 months, definitely one for the collection, thank-you so so much! So glad to hear, Mia. I love it too, and have made in many times since I discovered it! I love this pie/cake love child. I’ve got a bunch of apples that are just screaming to be used. I’m sure you would enjoy it, Toby. Still one of my favourites! I was stopping in to let you know I’ve made your (kinda) crumb cake – but I see the trackback has already done it for me. Yes, it was delish… even with our necessary changes. Thanks so much for sharing it! Made this today. I wish it had more cinnamon so I will be adding more next time I make this apple crumble. It turned out really well even without springform just have to make sure you grease the baking container (i used a ceramic/baking bowl that;s about 8 inch in diameter.) Looks beautiful and tastes great! Thank you. Glad you enjoyed it, Donna. I just looked at your website….LOVE your photography. Please keep sharing with us! I just made this Jennifer and we all loved it. Thank you for such a delicious recipe! So glad you all enjoyed it, Glenda! I’m thinking of veganizing this cake, because it just looks too good. My question is what do you think does the egg mixture do to the rest of ingredients? Moisten it and hold together mainly (eggs as a binder)? Hi Bee. Yes, the egg/cream mixture holds the apples together. It bakes up into a custard-like sauce that surrounds the apples. If you can find a vegan custard recipe, I think that would be a good starting point for veganizing. As I am enjoying watching the Winter Olympics and checking out recipes on Pinterest, you have commanded my complete attention. I love to cook. I too love to create. After living half my life growing up in the South and the present half in So California I have such an eclectic love of so many cuisines. However, of all the hours that I have pinned some favorites and yet-to-be favorite recipes, I think that you are one of the most talented, interesting and intriguing recipe writers that I have had the pleasure to read. You seem to have a sincere love and honest communication of wanting your readers to throughly understand your recipes. Bravo on providing the weight of your baking ingredients.I find your recipes very educating. Thank you! And I hope that your wrist heals very quickly. By the way, if you have a chocolate chip cookie recipe that crisps around edges w/out going flat I would be grateful. I don’t know if living by the water affects them or perhaps needs baking powder? Should be so easy!!! Thanks so much Carmen and I’ve been spending some time enjoying the Olympics, as well! I love to cook and create, too. I share only my best creations and do sincerely hope that everyone enjoys them as well. As for the chocolate chip cookie recipe, I stopped trying new recipes after I made the Jacques Torres ones from the New York Times (recipe here – http://www.nytimes.com/2008/07/09/dining/091crex.html?_r=1& ). They are the perfect CCC in my opinion. If you try them, be sure to make them as written (including using cake flour, resting the dough 24 hours and make them as large as they suggest and with some salt on top). I guarantee, you won’t be disappointed. Thank you so much!! I can’t wait to try. It’s just been one of life’s little challenges. Using your link to perfecting Hollandaise sauce for my Husband’s Eggs Benedict Birthday Breakfast tomorrow. You’re welcome and Eggs Benny for breakfast sounds divine! Just made the cake – it looks and tastes wonderful. Is the filling supposed to be somewhat “custardy”? Yes it is Susan. It’s a bit of a loose custard, but definitely that flavour profile. Glad you enjoyed it. Thanks Jennifer. Btw, I’m originally from Ontario and am always on the search for great Canadian recipes that I can’t see to find here…sweet and savory. I’ll research your recipe index as I’m sure you have tons of great dishes! I decided to look around your blog a bit more, and your recipes are all so tempting! 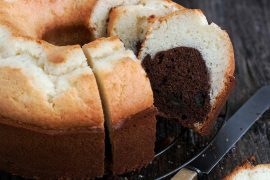 You’ve sold me on this cake; with all the different textures and flavors, it sounds heavenly! I especially LOVE that crumble topping. Thanks again :) I loved this cake. I’ve made it several times since I posted it. It’s great to bake up and take to friends/dinner etc. Everyone loves it and it travels well. Do enjoy Giulia and Merry Christmas! Cake looks awesome! Do have sugestions for those who dont have a food processor? If you have a blender, you can try that (with a gentle touch – just until sand-like). Failing that, use a pastry cutter or two knives to cut the butter into the flour until very small pieces. I was wondering we’re only supposed to have one layer of the sliced apples in the pan? Maybe my apples are more large than medium but I still have a lot leftover after placing the sliced pieces on the base mixture. Hi Yesim. No, you can pile them up. Just avoid the edges (pile them up in the middle and to within an inch of the sides). Hi! Thanks for sharing this wonderful recipe. Mine is in the oven as I type this… However, I just noticed my springform pan is leaking! A good amount of the egg mixture leaked out… now I’m hoping it will still be good and not a total waste of ingredients! I even covered the base and sides of the pan with strips of parchment paper and I was hoping the 20 minutes of baking the “base” of the cake would have sealed in the seams but I guess I was wrong. This pan is going in the trash when this cake is ready. Wish me luck! Crossing my fingers for you, Joyce. You know, I half expected some leakage when I baked mine (baked it on a baking sheet, just in case), but thankfully, mine held tight. Just a thought, but maybe the parchment on the sides might have worked against you here, as the base probably seals up a bit better when baking right against the pan. Let me know how it comes out. I made this scrumptious cake yesterday. I made it in an 8″ springform and it was so TALL! Everyone loved it and I can’t wait until after dinner tonight to have another piece! Also going to share it out with some friends today (otherwise, I would be eating the whole thing). Thank you for such a wonderful recipe. So glad you enjoyed it, Helena. I loved how tall this cake was! Feels extra special, doesn’t it? How many days do you think it would keep? I would like to make ahead for Thanksgiving? Would it be freezable? Hi Katie. It was good on day after it was baked, but I wouldn’t push it any further than that. It’s very moist with all the apples and it will become soggy eventually. As for freezing, I haven’t tried it, so honestly not sure how it would work out. I would be worried about it being soggy once it thawed. My husband and I really want to make this cake tomorrow, but we were wondering if we could use a nine-inch springform pan instead. Thank you! Hi Maddalena, I think you should be ok. Your cake will be shorter, of course, but other than that, it should be fine. I just wanted to let you know that it came out really well. Our guests loved it! Thank you for sharing this recipe. So glad to hear, Maddalena. Thanks for letting me know! Do you have to use a springform or can you use a 10″ round? I don’t think a 10″ round would be high enough, unless you happen to have one with 3″ sides. This cake came up quite high on the springform. You’d also have trouble getting it out of a regular pan, I think (if appearance is important). I made this today,and it came out lovely. I had no cream or half and half, so I used canned milk. I also added cinnamon to the custard base and baked at 350. Glad you enjoyed it, Laurie. How long did it bake at 350? I fancy trying this it looks delicious. Crumble is my favourite dessert. Not sure about the table cream though? I wonder if single cream is similar? I’m in the UK. Hi Andi, Yes, table cream in Canada is comparable to single cream in the UK. You could also use double cream, but I found the lighter cream quite nice. This is going to be the feature of my Thanksgiving dinner. Thanks for sharing. It will be lovely for Thanksgiving, Darsha. Enjoy! This looks amazing. I’ll be making it this weekend. What kind of apples did you use? Thanks Liv. I think I used Courtland apples (or maybe Empire). Any good cooking apple will work well. This sounds amazing! Apple bounty everywhere. I love the color of the edges! Oh, I love the sound and look of this cake. I know what our baking project will be this week! Thanks Cheri. I’m sure you will enjoy it! And I’ll be trying your Hazelnut Coffee Creamer soon, too! Thanks, Ceclilia. You have a beautiful blog! Enjoyed browsing. Great photos. This looks amazing. This looks like something my entire family will enjoy. Thanks Angie. It’s definitely family friendly! Whichever muses led to this finished product, whether they be the Italians or just Fate, I must tip my hat to them and to you for staying the course. This pie/cake looks positively mother-in-law worthy. Thanks Denise and thanks so much for visiting. I have a trunk full of apples and my curiosity is peaked enough to give this a try. annnnd my mouth is officially watering! Thanks Jacquelyn. It was a treat. Highly recommend! Your cake looks fabulous, I adore the crumble topping! Thanks so much, Laura and yes, that crumble was yummy.